When we started the Compete Sports Diversity Awards back in 2010 who could have known how fast this event would grow? In the past six years we’ve honored a large number of truly great and worthy individuals and organizations for their important and varied contributions to the sports diversity movement over the years. Compete has honored professional athletes, such as NBA players and twins Jason and Jarron Collins; MLS player Robbie Rogers; former NFL players David Kopay, Wade Davis and Esera Tuaolo; former MLB player, now MLB vice president of social responsibility and inclusion, Billy Bean; World Rugby champion Ben Cohen, MBE; PBA bowler Scott Norton and others. We’ve honored amazing non-professional athletes, like softball/flag footballer Molly Lenore; WeHo Dodgeball’s Jake Mason; blind bowler K Marie, volleyballer R. Tony Smith and so many more. We’ve also included some wonderful LGBT athletes and advocates, like multi-sport athlete Cyd Zeigler of Outsports; HIV/AIDS advocates like swimmer Jack Mackenroth and AIDS/LifeCycle’s Kristin Flickinger as well as former basketball player, coach and now director for The National Center for Lesbian Right’s Sports Project, Helen Carroll, to name just a few. Some of the prestigious organizations we’ve honored have included Nike, MillerCoors, Walton-Isaacson, Wells Fargo, Desert AIDS Project, Team DC, the National Gay Flag Football League, Major League Baseball, National Basketball Retired Players Association, Los Angeles Dodgers, Los Angeles Lakers, Phoenix Mercury/Suns, among many others. This year we will be adding new honorees to Compete’s distinguished list. This year’s winners include former MLB out umpire Dave Pallone, the PGA of America and Team Colorado of the Rockies, plus a number of other award recipients (we don’t want to spoil all the surprises so check out next’s month issue for a complete list of honorees). We’ve also renamed our Inspirational Athlete Award to the Molly Lenore Inspirational Athlete Award to honor Molly, the award’s first recipient back in 2012. She is a trailblazer, someone who was then and continues to be an inspiration to all who know and work with her in sports as well as in the business world. We want future honorees for this award to recognize the legacy she has created. They’ll have big shoes to fill! 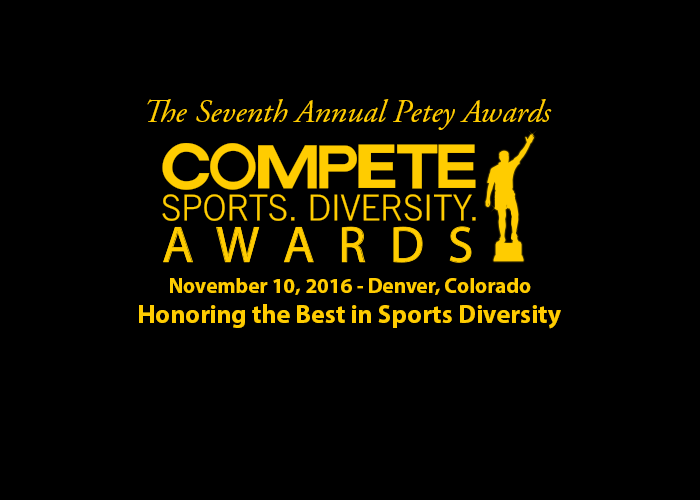 The 2016 Compete Sports Diversity Awards presented by Orbitz are being held in Denver on November 10, 2016. To join us, please visit www.sportsdiversityawards.com.